More than anything, Nadine Reistetter's family didn't want her to be alone. She had cancer that was terminal and was receiving palliative care at Mt. Sinai Hospital in New York but they knew she needed hospice services. They also knew they wanted her back in New Jersey, close to home. "We looked at an in-house hospice at a New Jersey hospital but it was just another floor of the hospital - very institutional," said Leslie Dwarin, Nadine's sister. "Then a social worker at Mt. Sinai told Nadine's daughter about Villa Marie Claire. When we saw it, we knew right away it was the place we wanted her to go." Nadine, 69, spent two weeks at the Villa, located in Saddle River, before passing in August 2012. Initially, she knew where she was and interacted with the nurses, even eating a bit. She was very comfortable and then when she slipped into unconsciousness, she still received the attentive care she had been getting when she was awake, Leslie said. "The nurses were fabulous," Leslie said. "And the services extended to the family were amazing. At some point, the patient doesn't realize what's going on but the care to the family makes the transition much easier." Leslie said she most appreciated being able to stay at the Villa, knowing she was close to Nadine. She split the nights with Nadine's daughters, spending nights in her room. The center also offers one room per patient for family members but they preferred being in the same room with her. One morning, Leslie had just gone home for a few hours when she got a phone call to return. "The staff members know when it's the end - they are very attuned to that," Leslie said. 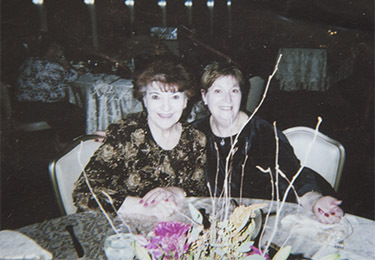 "I was able to get back in time and talk with her until she passed. I don't know if she heard me but it was comforting to me and my nieces knowing she wasn't alone." Leslie feels so strongly about the care given to Nadine that she volunteers at the Villa now, driving from her home in Cherry Hill a few times a month to work at the reception desk or meet with patients' families. "I just wish more people in positions at the hospitals - the doctors, nurses, discharge planners, and social workers, would tell patients' families about it," Leslie said. "No one even told us it existed. It's such a shame because the people there are so respectful, there's no trauma and the surroundings are so peaceful. It's 24-hour nurturing and care."